People like online casino play, and people like dogs. It’s hard to imaging that the meeting that ended with the decision that Buddy Slots would be created went any further than those two statements. If you open up Buddy slots (or any of its network brethren, for that matter) and then open up another tab on your browser and go to that, you will receive a message in the Buddy slots tab that says “Hey” and “Come Back”. It’s easy to see what the intention is here, and there’s no doubt it’s supposed to be a charming addition, but it feels dangerous in an online casino scene where the focus on the protection of vulnerable gamblers is at an all time high, such messages are badly thought out and need to stop. So, Buddy Slots is a casino with a basic theme and an addition that makes it immediately less tempting as a site. This leaves this online casino with a huge amount of work to do if it’s going to rise past these issues and take its place amongst the established sites that dominate the highly competitive online casino industry, is this something this site can do? Looking at the Buddy Slots site for the first time will not exactly fill one with confidence when it comes to the answer to that question. A logo that is barely a logo, simply the word “Buddy” spelt with a pawprint taking the place of the ‘u’ (we can all accept that a pawprint looks nothing like that particular letter, but that’s quite low down on the list of issues that are present here) is the first of many dismal design touches that have to be dealt with at this site. A picture of a pug stands proud as the centrepiece of the homepage, which is something that will certainly appeal to dog lovers, and the blue and yellow colour scheme is not necessarily unattractive, it just does very little to excite the eyes or the mind. Navigation is easy enough, with thumbnails offering quick access to games, and all promotions and information simple to locate if you need to. However, navigational tools do not make up for the lack of effort that has been put into the design here, and leaves Buddy Slots feeling like a poor attempt at an online casino site, aesthetically at least. If Buddy Slots is to be an online casino that has the ability to make any level of impact on the market, the games have a lot to do, and, unfortunately, there just isn’t quite enough on offer here to do that. 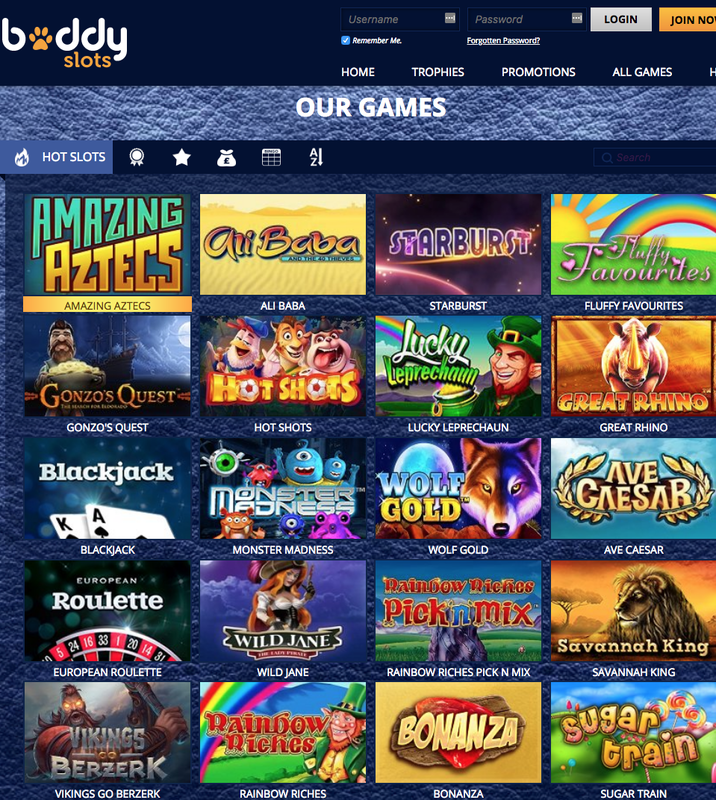 The focus is mainly on slots, and a collection of titles from the likes of ELK Studios, Eyecon, Gamevy, iSoftBet, Microgaming, NetEnt, NextGen Gaming, PariPlay, Playson, SG Digital, and Yggdrasil means that there is a fair few of these to choose from, but not quite enough to compete with other sites. Looking past slots, there’s very little else on offer here, as the name suggests. You’ll find a few bingo games, roulette, and a couple of other table and card games such as Jacks or Better, but nothing that comes close to causing Buddy Slots to stand out in any way. In short, this is a distinctly average site, which has been released at a time when average simply does not cut it any more, so there is little hope for Buddy Slots.